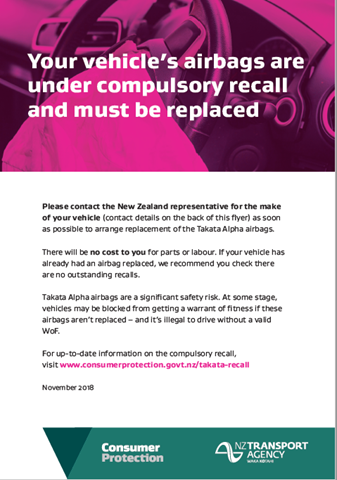 The NZ Transport Agency is still seeking inspectors’ help with the Takata Alpha airbags compulsory recall – and this will continue for the next few months. If a vehicle comes up with a match, please let the owner know and give them one of the flyers that were sent out in December 2018. Please note that requirements have not changed – vehicles should not be failed for a WoF because of the airbag recall. However it is highly likely that vehicles will be ban-flagged in future for not having Alpha airbags replaced. We’ll be re-running some posts on our Facebook page soon, reminding vehicle owners about the important role WoF inspectors may play in advising them if their vehicle is affected. 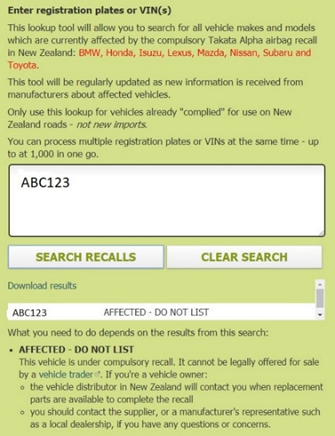 These posts will be in addition to other activity to raise general awareness about the recall and advise affected vehicle owners directly. We appreciate the efforts of inspectors to date – we’ve even had great reports of some sites going the extra mile by reviewing recent check sheets (in one case going back 12 months) and contacting affected customers, as a valuable customer service.